This Nozawa Tours page is presently being updated. More information will be available prior to the start of the 2016/17 ski season. Also see 11 must see things in Nozawa Onsen. Perhaps you want to take some time off to explore or perhaps there are non-skiers in your party? Well, there’s plenty to do and see in and around Nozawa Onsen. All guided Nozawa tours can be arranged for groups with a minimum number of two or more. Snow Monkey tours are available from December through February. Please reserve at least one week in advance, to ensure seating and arrangements. Iiyama is just a short bus ride away from Nozawa Onsen. Amidst the region’s rich natural landscape, a unique history and culture, sense of tradition, and kindness has flourished in Iiyama. With elegant streets lined with temples, deep forests and highlands, and specialty produce each season, the area is full of charming attractions. There is a tourism office in Iiyama Station and a number of good shops and restaurants (including a sushi train and Hana-no-eki – a local farmers market) along Route 117. Don’t forget to check out the Iiyama Snow Festival which is held in mid-February each year. 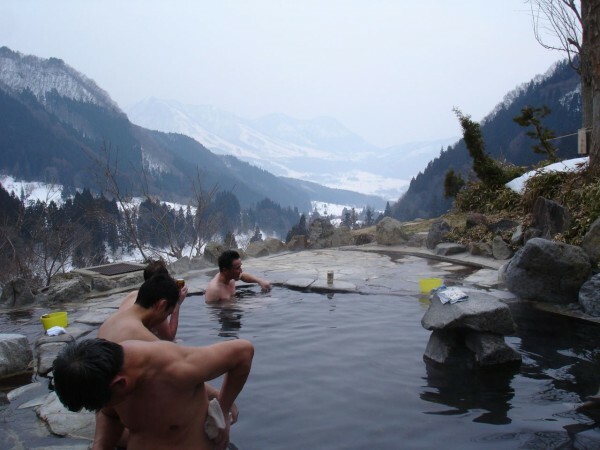 A journey to a tiny hot springs, perched high on the cliffs down the valley from Nozawa Onsen. 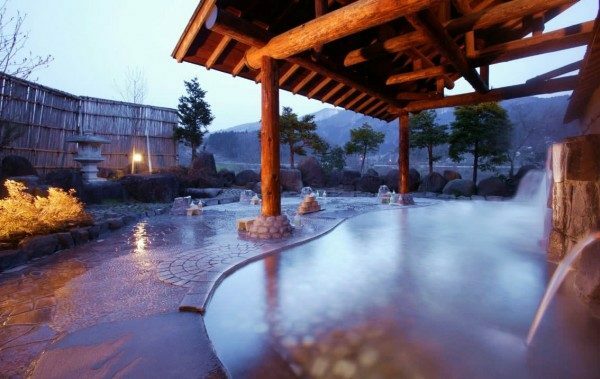 Ride up the winding roads that lead to this scenic location, then enjoy a relaxing, healing soak in one of the town’s onsen, or hot springs. Makes an ideal after-ski expedition – great for soaking away any sore muscles! Be sure to bring your own towel!). Check with your hotel for transport options. Togakushi is situated in the north of Nagano within the Joshinetsu National Park just 45 minutes drive from Nozawa Onsen. This volcanic area has an altitude of 1,200m and is located at the foot of the two volcanoes, Togakushi and Iizuna. The village nestles amongst 900 year old cedars and is not only a beautiful place to visit but it’s delicious soba noodles are also famous throughout Japan.Togakushi-jinja (Shrine) stands in the midst of a wood with cedar trees that are over a hundred years old, just at the foot of the precipice of Mt. Togakushi. It consists of three shrines – the lower shrine is Hoko-sha (Treasure of Light), the second Chu-sha (Middle Shrine) and the third Oku-sha (Deep Sanctuary). They were built at intervals of roughly two kilometres (see Togakushi Shrine map). There is also a small reproduction ninja village and school. Catch a bus to Iiyama then train to Nagano (about 30-40 minutes) then get on the local bus headed for Togakushi (about 60 minutes). See the Togakushi Village page for more access details. A visit to the Nagano area would not be complete without seeing the famous Zenkō-ji Temple, said to have been built in the early 7th century. It consists of 39 buildings including Dai-hongan and Dai-kanjin and is the main tourist spot in Nagano. Since the temple is not affiliated with any one particular sect of Buddhism Zenko-ji is open to everyone regardless of their belief, and it is believed that a visit there once in a lifetime will ensure a passage into the Land of Happiness. The temple has grown on the basis of this popular belief from ancient times and therefore been popular amongst a great variety of people throughout its history. Half day guided walking tours are available. Check here for more information or Zenkoji Temple Walking Tour. Take the train to Nagano City from Iiyama Station (about 10 minutes by bullet train or 40 minutes by local train), then take the Dentetsu line train to Gondo or Zenkoji stations and walk about 10 minutes. Alternatively get on a bus or just walk – it takes about 20 minutes. With 400 years of history, Matsumoto Castle is a National Treasure that every Japan visitor should see. Formerly called Fukashi Castle, it was a branch castle of the Ogasawara family during the long period of the warring states. It is located in the city of Matsumoto, in Nagano Prefecture and is within easy reach of Nozawa. It takes 70-100 minutes to get to Matsumoto from Nozawa Onsen. Matsumoto castle is located only a fifteen minute walk north of Matsumoto station. Located half way between Iiyama and Nozawa Onsen you can enjoy the views of the Chikuma River as you relax in the simple stone open-air rotemburo. This family-run establishment could quite posibly be the best bargain in the area. For only three hundred yen you get your choice of the indoor bath or outdoor rotemburo. The change of each season is uniquely distinct and you’ll be hard-pressed to find a better deal. Go toward Route 117 directly down from Nozawa Onsen. Go across the blue-gray Yutaki Bridge and the onsen is just on the other side. Ask your hotel to arrange a taxi for you. Take a day trip to Joetsu and enjoy a kaitenzushi lunch – sushi on a revolving belt. Take a look at the source of that seafood, the Sea of Japan, and a trip to the fish market. Check out the scenic setting of Takada Park, with Takada Castle and its moat next. Need some shopping therapy? Check the Jusco/Wing Market shopping area. Take the shinkansen one stop to JoetsuMyoko Station from Iiyama Station. From there change to the local line. See more information and maps here! Togura Kamiyamada Onsen is about 90-120 minutes by train from Nozawa Onsen and has approximately 15 active geisha that continue to entertain visitors to the Japan onsen town. Their services can be arranged through your ryokan or via Tyler at Kamesei Ryokan. The geisha entertain with dance and music performances, drinking games and small talk in Japanese. They are usually hired in pairs for 2-hour periods for 18,000 yen per geisha. They are typically called to liven up dinner banquets with lively, colorful conversation and warm hospitality. By request, they can also perform songs and dances as well as engage the guests in parlor games. For performances, the ‘tachikata’ (dancers) are accompanied by the ‘jikata’ (shamisen and taiko players). Minimum of 2 (1 tachikata and 1 jikata) recommended for performances. For guests that can be flexible with their banquet times, geisha entertainment can be arranged for shorter time periods prior to their other engagements for a lower rate, typically a 30-40 minute period starting at 5:30-6:00pm for 10,000 yen per geisha. With this 30-minute show, the geisha will perform some songs such as the area’s traditional love song Kamiyamada Ko-uta, teach the group how to dance to the ‘Tanko-bushi’ (Coal-Miner) or similar song and have the guests join in dancing around the room. Then the geisha will challenge everyone to Konpira Funafuna or other geisha parlor games, followed by time for pictures with the geisha. As a separate activity visitors can try on a real-life geisha kimono with assistance by actual geisha. See here for more details. The new Hokiriku Shinkansen offers great new Nozawa Onsen Day Tours possibilities. From the new Iiyama Station you may want to consider visits to one of the following. Kanazawa is a leading tourist city where 8 million tourists visit every year. It was a great castle town ruled by an influential leader from the 17th century to the second half of the 19th century. Kanazawa has not suffered from any war devastation or large natural disasters. The legacy of this is that Kanazawa has maintained rows of historical houses and various traditional handicrafts and traditional performing arts. Itoigawa is a rustic small city on the shore of the Sea of Japan, where mountains of the Northern Alps meet the sea. The home to many farmers and fishermen, Itoigawa never fails to serve a variety of fresh local food. Along Lavender Beach in Omi one can fossick for jade that is washed down from Hisui (Jade) Gorge in the mountains. Toyama is located at the centre of Japan and serves as a gateway of the Sea of Japan. Surrounded three sides by steep mountains and faced to the deep sea, Toyama is blessed with rich nature where people can enjoy sublime scenery and tasty foods at the same time. The historic village of Shirakawa-go was registered as a UNESCO World Heritage Site in 1995. Shirakawa-go is famous for preserving the traditional gassho-zukuri style houses with the iconic thatched roofs, some of which are more than 300 years old. Book a one day tour ex Kanazawa! Karuizawa has thrived as the most popular international summer resort in Japan since the late 19th century. Restaurants, coffee shops, boutiques and fashion goods shops stand side by side in the Karuizawa Ginza district, making Karuizawa a popular day tour resort destination. There are several rent-a-cycle shops near the station to help the many well maintained tourist attractions are located in the surrounding area. There is a large choice of ‘factory outlet’ shops near the station. Catch a train to Nagano then get on the shinkansen heading for Tokyo (about 20 minutes). Check your schedules here and remember not to get back too late or you’ll miss the last connecting train.